What does a work of art taste like? Does a painting have a unique smell? 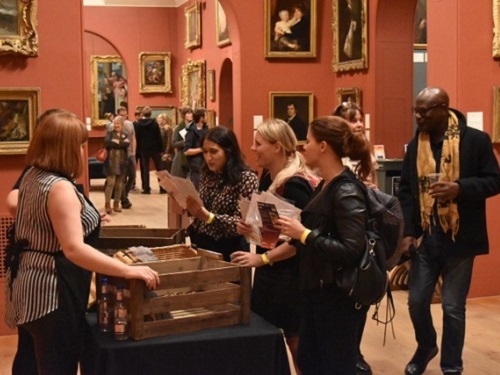 Enjoy a sensory exploration of different works of art through taste and smell with award-winning food historian Tasha Marks, founder of AVM Curiosities.This Aroma-Tour will match works of art to a bespoke smell or taste in the form of perfume tabs and a drink, each individually packaged for you to keep. In this treasure hunt you’ll start thinking about art in a different way. Smell is the sense most closely linked to memory so it’s an acquaintance with an artwork that you’ll never forget. The Aroma Tour is free, so tell your friends and just come along between 6 and 8.30pm. This event is also a great opportunity to see our exhibition Prized Possessions for free! AVM Curiosities has been exploring the relationship between art and food through a series of events and edible interventions since 2011. Founded by Tasha Marks, (Grey Goose Iconoclast of Taste 2013, Selfridges Bright Young Thing 2013 and Young British Foodie 2013 – Experiential Finalist) AVM Curiosities champions the use of food as an artistic medium, with projects ranging from museum exhibitions and sculptural installations to interactive lectures and limited-edition confectionery.